Life on Long Island is great - we've put together our top 50 reasons why we love living on LI, but clearly there are a lot more than that to why folks love living on LI! There are the obvious reasons like the beaches, its close proximity to New York City without having to feel like you’re living in the hustle and bustle of it, the four changing seasons, and then there are the things you probably didn’t know about the Island. Take a run through this list below and you’ll see why people choose Long Island to call home, why so many come here to vacation, why people come here to shop, why people choose to spend their days off and weekends here, and so much more! 1. No Matter Where You Live on Long Island, There’s a Beach Close By! Whether you enjoy walking on the boardwalk, catching the waves, sitting back and relaxing in the sand, or building sand castles with the kids, there are plenty of beaches to head to. From Jones Beach to smaller, local beaches, you’re bound to come across one wherever you are on the Island. 2. You're Close to New York City Without Having to Live in the Hustle and Bustle of It. Need to get to the City? Not a problem! It’s just a quick drive or train ride away. 3. No Matter the Season, You Get Natural Beautiful Scenery. Just when you get tired of the heat, you know Fall is around the corner. Or, just when you get tired of the snow, you know Spring is around the corner. Living on the Island gives you all four seasons and the beautiful natural scenery that comes with it. 4. You Get to Vacation Right Where You Are! Aside from the beaches, Long Island has plenty of places to head to for a day trip like Fire Island, Greenport, or Robert Moses State Park. 5. It’s Home to a Number of Historic Estates. On top of being a place where many Hollywood stars find their mansions, Long Island is also home to historic estates like President Theodore Roosevelt’s historic family home and Walt Whitman’s childhood home. 6. You Can Head to a Farm for Pickings All Year Long! Long Island is home to many farms so you and the kids can enjoy fresh fruits and vegetables all year long. 7. You Don’t Have to Travel Across the Country to Enjoy Vineyards and Winetasting. If you haven’t heard, the North Fork is like the Napa Valley of the East. The Hamptons is also home to several vineyards. Enjoy plenty of vineyard and winery tours right on the Island! 8. You Can See Lighthouses Any Day You Want! Long Island is home to quite a few lighthouses, including the first lighthouse in New York state – the Montauk Light House. 9. You Get to Devour Fresh and Tasty Seafood Everyday! With Long Island being surrounded by water on all three sides, harbor villages are all around with restaurants serving fresh and tasty seafood. 10. There’s History to Learn on Long Island. Ever wonder how people lived or traveled before there were cars? Make a visit to the Stony Brook Carriage Museum and you’ll see antique carriages or make a visit to the Old Bethpage Village Restoration. 11. It’s Home to One of the Largest Independent Bookstores in the US. Book Revue in Huntington continues to stand as one of the largest independent bookstores in the country (founded in 1977). Enjoy visits from the greatest authors for readings and signings! 12. The Country’s Oldest Continuously Operating General Store is Located Right Here! The St. James General Store located within the Deepwells Farm Historic Park has been in operation since 1857. The historic institution is considered to be the most authentic general store in the country. It continues to sell things like jams, jellies, candies, toys, games, items made by local craftspeople and baked goods. 13. It’s Home to One of the Country’s Largest Shopping Malls. Shopaholics can find a place they can call home at Roosevelt Field Mall. This is one of the largest shopping malls not just in NY state, but the country! – Ranked 2nd largest in NY state and 9th largest in the US. 14. There Are Endless Place to Visit to Get Spooked. There’s no better place to get spooked during the Halloween season than on Long Island. It's home to some of the best haunted houses! 15. You Get to Enjoy Concerts Under the Stars All Summer Long! Summers on Long Island get even better with the amazing lineup of concert performances at the Jones Beach amphitheater. 16. It’s the Birthplace or Home to Stars Growing Up. From Walt Whitman, Theodore Roosevelt, Mariah Carey to Billy Joel, these are some of the people among many other famous stars who have called Long Island their home. 17. It Has One of the Fanciest McDonald’s Restaurants You’ll Ever See! The McDonalds of New Hyde Park doesn’t look like your typical McDonald’s restaurant. It’s more like a McMansion because the place was originally a farmhouse. 18. Malls… Malls… and More Malls! On top of Reason #13 with Roosevelt Field Mall, shopaholics can also shop, shop, shop at Walt Whitman Mall, Tanger Outlets Riverhead, and many other malls. 19. You Get to Catch Great Performances At Theaters! From Nassau Coliseum, The Paramount, to Bay Street Theater, every week is packed with some great music and theater arts performances on the Island. 20. Pumpkin Picking Is Nearby. While others may have to travel several hours to get to a pumpkin picking farm, Long Island has loads to choose from and they even offer great entertainment like corn mazes, hayrides, and much more! 21. There Are Endless Options to Walking and Hiking Trails! From its beaches, parks, ponds, preserves, arboretums, to sanctuaries, you can easily enjoy a scenic walk or hike. 22. You Get to Enjoy Beautiful Displays of Holidays Lights! There’s nothing like talking a drive down a road of holiday lights after holiday lights to get the family into holiday spirit. Popular ones include the Girls Scouts of Suffolk County Holiday Light Show and the Holiday Lights Spectacular at Jones Beach State Park. 23. There Are Plenty of Rinks for Ice Skating or Roller Skating. If you love skating, you can skate all year long because Long Island has plenty of ice skating and roller skating rinks. 24. You Can Catch a Glimpse of Whales. Whale watching tours are available on the Long Island Sound or along the South Shore. You’re bound to catch a glimpse of the majestic sea creature living on the Island. 25. There’s Nothing Like the Freeport Nautical Mile! Making a visit to Freeport is a wonderful experience. You get to enjoy a picturesque waterfront, waterside dining, and the opportunity to escape to Long Island’s maritime past. 26. You Can Visit Several Museums In One Place! Planning a museum day on the Island isn’t hard because a visit to Museum Row means you can visit the Cradle of Aviation Museum, the Long Island Children’s Museum, the Nassau County Firefighters Museum and Education Center, and the Long Island Museum for Science and Technology (under development) all in a day. 27. Adventure is Around the Corner with Bayville Adventure & Scream Park. Where else do you get to enjoy a pirate themed miniature golf course, a fun house, a mirror maze, rope courses, and endless family fun! 28. There Are Endless Summer Concerts at Parks! There are so many to choose from and they vary in music variety that Summer’s on Long Island are always entertaining. 29. You Can Get Close to Farm Animals. With all the farms on Long Island, your options of getting close to farm animals are plenty. There’s also interesting annual events like sheep shearing to enjoy! 30. You Can Easily Plan a Romantic Evening. Long Island has many restaurants located right on the water, so planning a romantic evening is easy! 31. You Can Experience a Classic American Hamburger Drive-In Joint! Anyone who wants classic American drive-in food and the restaurant experience knows they can get it at Massapequa’s All American Hamburger Drive-In. 32. You Get to See a 20-ft Tall Duck! In Flanders sits The Big Duck. This national landmark served as a place to sell raised ducks at one point. Today it is open year-round as a tourist destination. You won’t see it anywhere else! 33. There Are Amazing Places Listed on the National Register of Historic Places on LI. Topping Reason #5, some others on the National Register of Historic Places include Oheka Castle, the Grist Mill, and Old Westbury Garden. 34. You Can See a 19th Century Whaleboat. That’s right! At the Cold Spring Harbor Whaling Museum, you can learn the history of whaling and see artifacts like a 19th century whaleboat. The Sag Harbor Whaling Museum also offers much to help understand Long Island’s whaling history. 35. You Can Go to an Amusement Park without Paying a Hefty Admission Fee. Adventureland in Farmingdale gives families hours of fun without having to pay the typical pricey amusement park fee because there is no admission fee. You only pay for the rides and activities you take part in. 36. You Get to Enjoy Thrilling Outdoor Adventures! Zip lining, aerial ropes challenge courses, trails with different challenge levels – you can get all of that at Adventure Park at Long Island! 37. It’s Where You Can Find an 120,000-Gallon Shark Tank. A visit to the Long Island Aquarium and Exhibition Center means you can take a trip under the sea with its amazing shark tank. The Aquarium also offers penguin encounters and it gives you a chance to explore tropical fish from around the world. 38. You Have Plenty of Options on Places to Go Fishing! Depending on the season, catch fluke, flounder, blackfish, bluefish, striped bass cod, marlins and even a shark with more than 60 different charter-fishing vessels. 39. Winter Fun Includes Sledding! Come Winter, Long Island can get quite a bit of snow. That simply means opportunities to have fun with snowball fights, snow angels, and sledding down some of the best spots. 40. Long Island is Home to Some Interesting Sports! Long Island has the New York Islanders (for hockey), the Long Island Ducks (for minor league baseball), the Long Island Rough Riders (soccer club), the New York Cosmos (soccer team), and amazing sporting events like the Belmont Stakes Racing Festival. 41. You Have Transportation Options! Sure having a car on Long Island is convenient, but there’s also so many other modes of transportation to get around, like the Long Island Rail Road (LIRR), Long Island ferries, and airports – including the two major international airports JFK and LGA, nearby. 42. Bowling Can Be a Cosmic Experience on Long Island! Long Island is home to several bowling alleys, some offering glow-in-the-dark bowling experiences. 43. You Can’t Imagine Life Without the East End! Why live anywhere else when you can have access to the beaches, golf courses, vineyards and farms, the historic Montauk Lighthouse, Splish Splash, scenic villages, parks, shorefronts, and adventure everyday on the East End! 44. Long Island Has Laws No Other Places May Have! There are laws on Long Island people may agree with and some that people may not agree with, but it’s all part of making and living on Long Island what it is. 45. People Will Be Under the Impression You’re of the Upper Class. Long Island has a reputation of being the richest part of New York, so even if you’re not rich, it feels good to know there are people who think you are. 46. There’s a Radio City Music Hall of Long Island! The Suffolk Theater was once known as “the Radio City Music Hall of Long Island” and it continues to stand as an important icon. It’s one of the most beautiful theaters on Long Island and offers amazing live entertainment. 47. It Offers the Best Air Show Every Year at Jones Beach. The Bethpage Air Show is an annual event that amazes and delights many each year. There’s no better place to be every Memorial Day weekend than here! 48. You Get to Enjoy Breathtaking Views While Kayaking. Kayaking on Long Island is especially unique at Shelter Island! Enjoy natural beauty and breathtaking views on this tiny island. 49. There's Long Island’s Gold Coast Area! The Gold Coast was once home to some of the wealthiest families in America, so you get to enjoy beautiful mansions among a scenic coastal area. There’s also the Long Island Heritage Trail encompassing the entire Route 25A corridor to discover and explore. 50. There Are Endless Things to Do for Free! You don't need to spend a dime to have fun on Long Island! On top of the beaches and outdoor concerts, there's loads of free events and things to do like walking the boardwalks, visiting a duck pond, visiting places like the Grumman Memorial Park, and much more! 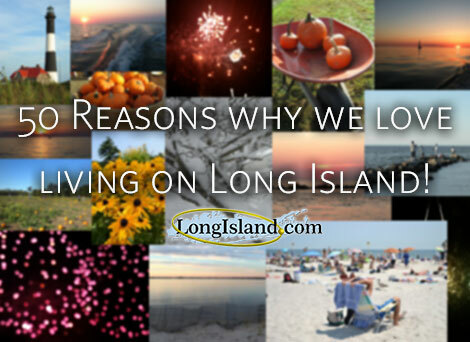 Have a reason you love living on Long Island that's not listed here? Let us know!